Reynosa, Mexico (CNN) -- Maria Jesus Mancha had just come from burying her son. In a city like Reynosa where a drug cartel imposes its rule at gunpoint, Mancha knows speaking out may be like asking for a death sentence. There was no way of knowing who was really inside. But that's the problem these days in Reynosa -- people suspect the cartel has eyes and ears everywhere. A few minutes into an interview, one of Mancha's daughters suggested she cut short the chat. "What's done is done. Just let it go now," she whispered. Another of the vocal exceptions, publicly condemning official corruption, is Jose Sacramento, a senator in President Felipe Calderon's ruling National Action Party (PAN). He's running for the state governor's office in July elections. "What we are seeing now across Tamaulipas state is the result of complicity between state and municipal police and organized crime," he said. In an off-camera chat, municipal police chiefs dismissed allegations that cops were on the Gulf Cartel payroll. But President Calderon's government has acknowledged police and military units nationwide -- not just municipal and state police -- have been infiltrated by the cartels. Fighting erupted in Reynosa at the start of the year between the Gulf Cartel and its former hit squad, the Zetas. 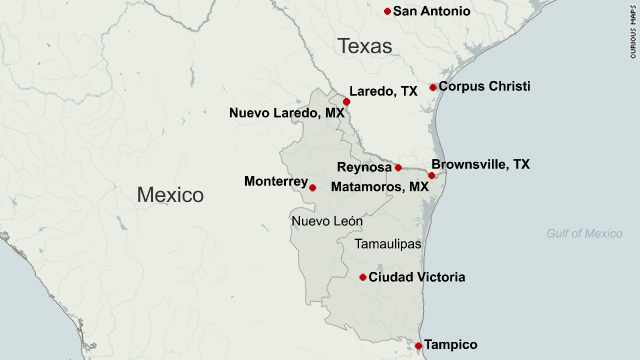 The war has spread along the border between Matamoros, across from Brownsville, Texas, up to Nuevo Laredo. At stake is not just control of cocaine and marijuana smuggling routes but migrant trafficking routes, and extortion and kidnap rackets. With the Gulf Cartel gaining the upper hand in Reynosa, the fate of a city of 500,000 inhabitants now seems to be in the hands of a pudgy-faced 37-year-old known by the codename Metro-Three. According to local residents, and the U.S. Drug Enforcement Administration (DEA), Metro-Three, whose real name is Samuel Flores Borrego, is a former cop who went rogue and is now the alleged head of Gulf Cartel operations in Reynosa with a $5 million U.S. State Department reward on his head. In its bid for supremacy, the Gulf Cartel has called in extra firepower thanks to an alliance with former rivals in the Sinaloa and La Familia cartels. Given the shifting sands of Mexico's drug conflict, it's difficult to predict how long that pact will hold. If it breaks down it will almost certainly herald a new spiral of killings. It's difficult to compare the levels of violence, or the threat of violence in Reynosa with other parts of Mexico. Reynosa City Hall officials said they "simply have no idea" how many people may have been killed so far. Unlike in other Mexican cities, officials here say they believe the cartels gather up and secretly dispose of their own dead. Red Cross officials say the vast majority of victims are cartel members, not innocent bystanders. Whatever the threat level to civilians, it's easy to become paranoid in Reynosa. During a five-day stay in Reynosa, pick-up trucks and luxury SUVs shadowed our movements. From time to time one of the trucks would crack open a window, revealing four men inside and the driver holding a walkie-talkie. On pedestrian streets, we were followed by three young men in shiny, sequined baseball caps -- one of the hallmarks of young cartel lookouts known here as "falcons." Visiting journalists have the option of leaving. It's a different story for the Mexican journalists. This year alone at least six journalists from Reynosa and the surrounding area have been "disappeared" by suspected drug cartel gunmen, according to Jaime Aguirre, head of Reynosa's Democratic Union of Journalists. It is not known whether they are dead or alive. It's also not known whether they were taken because of their reporting. In a bid to survive, most local journalists seem to have decided self-censorship is the better part of valor. There's little news of the home-grown drug war in the newspapers or on the radio. "It's not fear but simply the lack of security which obliges us to keep certain things quiet," Aguirre told me. "Our state (Tamaulipas) is ranked first in the number of disappeared journalists. We simply have no guarantees to be able to inform about daily events." The information void left by the traditional media is being filled by concerned citizens using web tools like Twitter. If they want to kill me for saying this then here I am. They killed me when they killed my son. I'm already dead. They warn of gangsters setting up roadblocks and of the echo of gunfire. They ask each other for status reports from neighborhoods across Reynosa and outlying border communities. The tweets flew thick and fast in February when the Gulf Cartel and the Zetas fought day and night in downtown Reynosa. The battles were so public that each side emblazoned the initials of their faction -- CDG, the Spanish acronym for Gulf Cartel, and "Z" for the Zetas -- on the side of their trucks. Senior city hall official Juan Triana has also stepped into the online fray. Drawing on advice from his two teenage daughters about how to use the social networking site, he opened his own Twitter account (@dirdegobreynosa). He and a colleague now work 16 hour days monitoring Twitter. If tweets are false Triana tries to halt the virtual psychosis. If they're true he simply warns readers to stay away from what he terms "risk situations." "It's clear the local media cannot inform about this. The immediacy of the information (on Twitter) is very useful to the community," he said in a face-to-face conversation. None of the other Twitter users on #reynosafollow agreed to meet in person in Reynosa. They said they didn't feel safe talking in the real world. In a virtual world, they're protected by their aliases. But back out on Reynosa's streets, the cartel-imposed law of silence reigns. And such psychological and physical threats of terror may be damaging people's mental health, according to Dinorah Guerra, psychotherapist and head of the Red Cross in Reynosa. "There is a huge risk for people's self esteem. They cannot speak about what they have seen or what they have heard," she said. "You lose yourself and lose your identity."